Star Pizza Roasted Garlic and Goat Cheese was an appetizer I recently tried at well, Star Pizza. I live in Houston, and to be honest, Houston isn’t known for great pizza. We have great Tex Mex food, Vietnamese food, and a variety of other great tasting dishes, but pizza, no. My friends have been saying that Star Pizza is the best, I have had Chicago Pizza, and New York Pizza, so I knew chances are I wouldn’t be impressed. I was completely wrong. Star Pizza has wonderful pizza. They don’t stop with just pizza, they have full menu, with a wide variety of dishes. Now I have loved roasted garlic, and goat cheese for as long as I could remember, but Star Pizza combined them, and this is one of the best appetizers I have had in a long time. This appetizer is easy to make at home. This dish combines roasted garlic, sun dried tomatoes, parsley, and a fresh bread. This recipe is so simple that someone without a lot of experience can recreate this recipe at home. 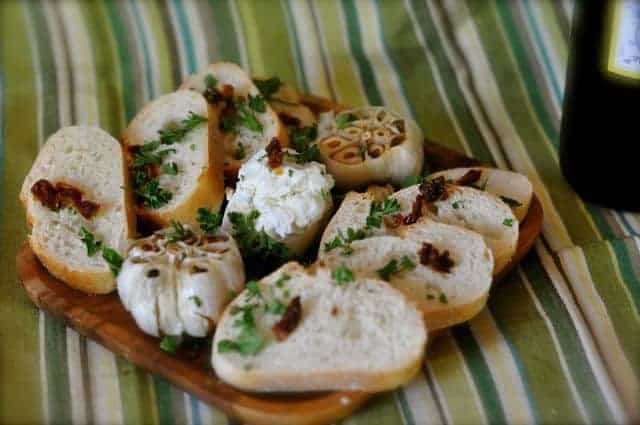 Star Pizza makes an amazing appetizer with roasted garlic and goat cheese. Preheat your oven to 400 degrees. Peal away the loose skins that cover the garlic, be sure to leave enough skins around the garlic so the bulb stays intact. Cut off about 1/4 or 3/8 inches off of the head of garlic, this should expose most of the individual garlic cloves. Drizzle each head of garlic with enough olive oil so the top is coated. You may want to spread around the oil with your fingers, if you don't cover the cloves of garlic, they may burn. Wrap each clove of garlic in foil, and place onto a baking sheet. Cook the wrapped garlic in your oven for approximately 30 minutes. You will know the garlic is done because it turns into a golden color and it is soft to the touch. Remove garlic from oven when fully cooked, and allow to cool while you plate the cheese and bread. Cut the bread into 6 to 8 slices that are approximately 1/2 inch thick. Place bread on a plate, place goat cheese in a small dish and set in the center of the plate. Place the garlic bulbs on the place. Sprinkle with sun-dried tomatoes and fresh chopped parsley. This looks delicious; the only thing is I don’t get how to eat it, lol! I would take the cheese and spread it on some bread and enjoy it like this. Wow , looks good. A whole roasted Garlic ! I have never had it before. But this looks savory. Do you guys accept advertisement?